Wolfmother is a Grammy Award-winning hard rock band formed in Sydney, New South Wales in 2000. The band originally consisted of Andrew Stockdale (guitar, vocals), Chris Ross (bass, keyboards), and Myles Heskett (drums), though Ross and Heskett left the band in August 2008. With the original line up Wolfmother released one album, Wolfmother, and six singles, the highest-charting of which was "Joker and the Thief" which reached number eight in Australia. In 2004 Wolfmother began appearing at several high profile music events, such as Homebake and the Big Day Out. They also released their debut self-titled EP through Modular Recordings. In 2005 the band made their way to Los Angeles, working alongside producer Dave Sardy (of Red Hot Chilli Peppers, Marilyn Manson, and Oasis fame) to record their self-titled debut album, released in October 2005. 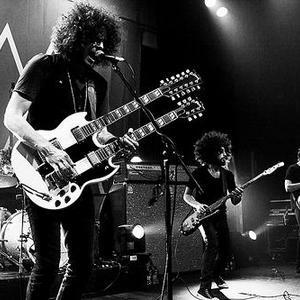 In 2006 Wolfmother dominated the Australian Recording Industry Association awards (ARIAs), taking Best Breakthrough Album, Best Rock Album, and Best Group. In August 2008, after headlining the Splendour in the Grass festival in Byron Bay, Australia, bass/keyboard player Chris Ross and drummer Myles Heskett resigned, leaving just singer/guitarist Andrew Stockdale. Andrew planned to find new musicians before recording another album. From February 2009 the new line up appeared in two secret gigs under the name Whitefeather. The band officially consists of Dave Atkins on drums, Ian Peres on bass and organ, and Aidan Nemeth as the surprise fourth member and a new guitarist. The new line up's first album, Cosmic Egg, was released in 2009. Now drummer Dave Atkins has decided to leave the band to spend more time at home with his family; he will be temporarily be replaced by The Mooney Suzuki and Har Mar Superstar drummer Will Rockwell-Scott.